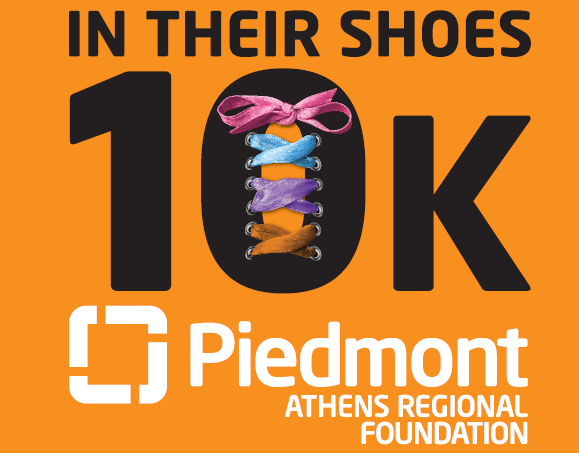 Come out and run or walk in the IN THEIR SHOES 10K at the UGA Tate Center in Athens GA, benefiting the Loran Smith Center for Cancer Support. The Loran Smith Center provides support to cancer patients and their families before, during, and after treatment. All services such as workshops, counseling, exercise and art therapy classes are free thanks to the generosity of people like you! Start and Finish at the Tate Center. 10K route is on all paved streets winding through the UGA campus. Registration fee is $45 for everyone after 3/11/19, so register early for discounts. Early Registration and Packet Pickup: Friday 3/22 from 2PM to 6PM at Loran Smith Center, 240 Talmadge Dr., Athens, GA 30606. Awards: Ceremony begins at 9:30AM. Awards for the top male and female and overall Masters Male and Female finishers. Age Group awards will be 3 deep in standard age groups beginning with 10 and under to 75 and over. Shirts and Goodies: Shirts are guaranteed to those who register by 3/11/19. Those who register after that date and on race day are not guaranteed a shirt or size. There will be plenty of refreshments. The In Their Shoes Block Party starts at 9AM and goes to 11AM. Course: Start and Finish at the Tate Center. 10K route is on all paved streets winding through the UGA campus.